You may have noticed that we’ve added a third check-in screen for your convenience. It is located inside the East Entrance (outside the Calvert Auditorium, across from the Art Room and BP Machine). 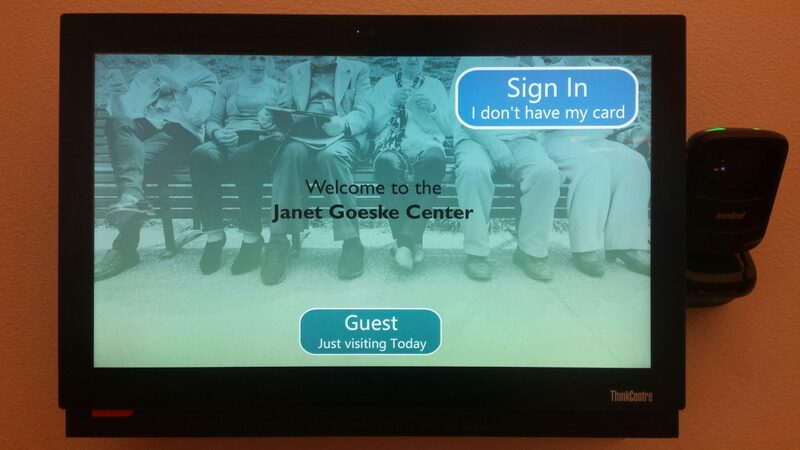 This screen is in addition to the two located at the Welcome Desk inside the Main Entrance. Thank you to all of our patrons who are using your patron passes regularly. This makes taking attendance much easier and allows us to evaluate program impact and success much better than before! *** If you have misplaced or forgotten your Patron Pass, you can sign in with your first name and the phone number we have on file. If you have any trouble signing in this way, please see the Welcome Desk so we can fix the issue . . . most likely we just have the wrong phone number on file. *** If you have never signed up for a Patron Pass, please do so at your earliest convenience at the Welcome Desk. A friendly and knowledgeable volunteer will show you how the system works and let you practice. Make sure you keep your Patron Pass on your keychain, lanyard, or wallet so you don’t lose it. Bonus Perk! If you ever misplace your keys and there is a Patron Pass attached, a staff member can easily look up the owner and contact you to let you know we found your belongings.